Combines a 6-in-1 formula to help with weight loss. Nobody wants to be fat and studies show that your weight has such a tremendous impact that it may be linked to personal and financial success. 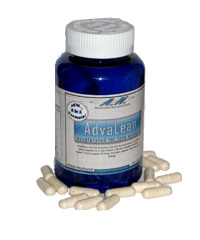 Thin is the trend of modern day society and Advalean is a tool that can help people achieve this goal. *Metabolic formula- Speeds up your metabolism helping you burn off the calories you consume with each meal. *Energy formula- Will increase your energy levels and raise your body heat through a process called thermogenisis. By increasing your body heat you naturally begin the fat-burning process. Increasing your energy will give you the motivation you need to be active. *Thyroid Support Formula- Helps support healthy thyroid function. Your body has a hormone called Thyroxine that stimulates thyroid function. By increasing the production of Thyroxine you stimulate your thyroid which will help your naturally burn more calories. *Appetite Control Formula- Helpful for suppressing your appetite. This decreases the amount of calories you eat, suppresses cravings for food, and keeps you from feeling hungry. This formula works well with low calorie diets! *Fat Block Formula- Blocks over 12 grams of fat each time you take it! With the power of Chitosan our fat block formula can help you cheat and still lose weight. *Carbohydrate Block Formula- Uses a special blend of ingredients to block up to 2700 starch calories using a modified USP test method. This means you can eat carbs with your meals. An obese person is at high risk for a number of serious health problems, including heart disease, high blood pressure, stroke, varicose veins, psychological stress, osteoarthritis, high cholesterol, and diabetes. Losing weight will have a positive long term effect on your health. Order Advalean Today!